"All new, exclusive material from two titans of the Norwegian Underground. Gatefold cover with 180gr vinyl only - No CD, No downloads, No streaming. Mastered by Billy Anderson (Sleep, High on Fire, Neu-rosis). Third installment in Fysisk Format's split series! This time the 12" comes wrapped in full gate-fold artwork by Black Qvisling (singer of Okkultokrati). 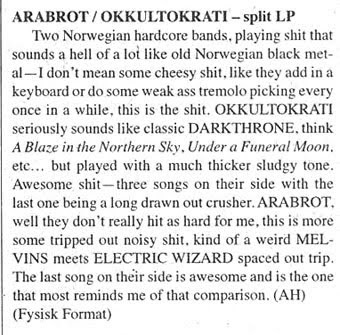 Okkultokrati has had a busy year with the release of their debut No Light for Mass and the following tour with Kylesa and has gone from zero to a massive underground cult phenomenon in no time."